Happy Ides of March, everyone! 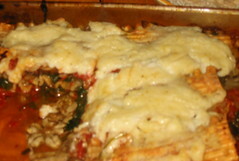 In honor of Julius Caesar, let us eat well, and with an Italian-inspired meal! 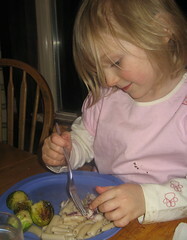 I remember making chicken with artichoke hearts in several different dishes in college, before I became a vegetarian. However, in the past 15 years a lot has changed and I don’t have all of my recipes from that time in my life! This recipe was inspired by the memory of those meals eaten with friends in one of the townhouses on the Skidmore College campus. 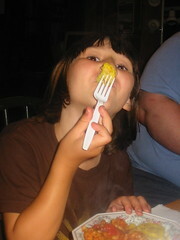 It was delicious then, and it is delicious in its current incarnation as well! Still easy, quick, and relatively inexpensive as well. 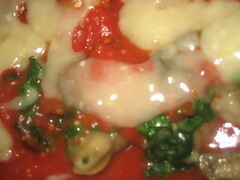 This is a delicious gfcf, gluten free, family-friendly recipe! It is also (if you double check ingredients!) a wheat free, dairy free, soy free, egg free, tree nut free, peanut free, fish free, shellfish free, top 8 allergen free, and South Beach phase 2 safe recipe. Cook pasta according to package directions. 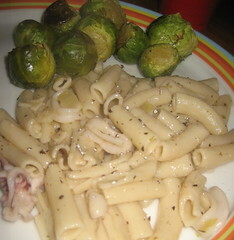 Double check cooking times – every pasta appears to have a different cooking time requirement! The chicken part should take about 10 minutes if everything is chopped in advance, so you can start the chicken when the pasta has 10 minutes left to cook. Warm oil in a large skillet over medium heat. 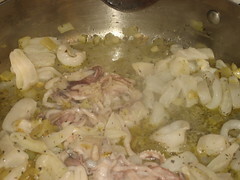 Add onion and garlic, cook until they begin to soften. Add chicken and spices to the onion/garlic mixture. Adding the spices at this stage will warm them in the oil and intensify the flavors. Brown the chicken. When the chicken has browned, add a splash of wine to deglaze the pan (optional). 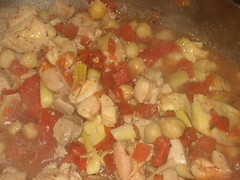 Add the can of diced tomatoes, red peppers, chick peas, and quartered artichoke hearts. Bring to a boil, then simmer, stirring occasionally. 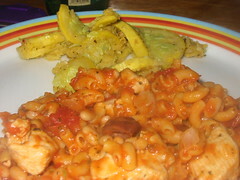 When pasta is finished cooking, drain, then toss with the chicken & artichoke mixture. Serve, and watch it disappear! We love Beef Stroganoff here. It’s got a deliciously creamy sauce, meat, sautéed mushrooms, and noodles. Add a salad or a steamed veggie on the side, and you’ve got dinner in less than 30 minutes, and for well under $10. 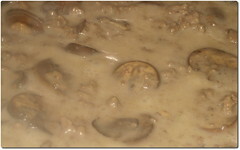 Our other Dairy Free Beef Stroganoff recipe required 3 pots, and was a bit of a hassle. This revamped recipe only requires 2 pots, and is less work. Same delicious taste, but with less work. What’s not to love? Remember: Coconut milk does not have a coconutty taste when used in a savory dish. For some reason, salt appears to eliminate the coconutty taste, and you end up with just a deliciously creamy dinner that tastes like you’re able to eat dairy again! Set a large pot of salted water over high heat so it will come to a boil for the pasta. Place a large skillet with a splash of cooking oil (we use canola or olive) over medium heat. Add onion and garlic, and begin to sauté. 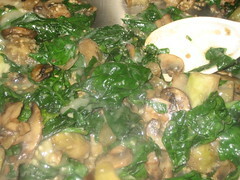 When onion and garlic begin to soften, add the mushrooms. Sprinkle a couple pinches of salt over them, and stir frequently. 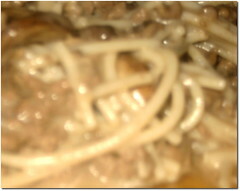 When the mushrooms have started to darken and shrink, add the ground beef. Sprinkle the Tony Chacheres Cajun seasoning, or a little more salt and cayenne pepper over the skillet and continue stirring. Add pasta to the water when it boils, and cook according to the package directions. When the beef is browned, sprinkle the mixture in the skillet with the starch. Stir, then add the coconut milk and lemon juice. Mix together well. The sauce will thicken as it cooks. Taste test and add more salt or Tony Chacheres or cayenne pepper as needed. Drain the noodles, then toss with the sauce – easy, quick, and delicious! The tang of the lemon, the slight kick of the Tony Chacheres and the creaminess of the sauce all meld in your mouth for much yumminess! I feel like I’ve been making marinara almost my whole life (my grandmother’s family is from Sicily). I’ve changed it a bit as I’ve grown older and changed myself. At this stage in my life I’ve tried to make it as easy as possible, while still retaining good flavor. I play somewhat fast and loose with seasonings, so be sure to taste test along the way! This amount makes enough to feed a family of 5 with some left over. It’s easy to half or double as needed. This is a delicious gfcf, gluten free, family-friendly recipe! It is also (if you double check ingredients!) a wheat free, dairy free, soy free, egg free, tree nut free, peanut free, fish free, shellfish free, corn free, top 8 allergen free, vegan, vegetarian, and South Beach safe recipe. Turn the heat up to High, and stir occasionally, waiting for the sauce to come to a boil. When it boils, turn it down to low or medium-low, allowing it to simmer. Let the sauce simmer for at least an hour to let the flavors develop. 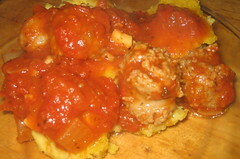 Make some polenta or pasta (we like Tinkyada Spaghetti), and serve with a nice salad for a delicious dinner! If you have leftover sauce, it freezes very well! I will sometimes make a double batch just to have some in the freezer for a quick and easy meal later. Pizza Sauce: Add about 1/2 tsp red pepper flakes with the other spices. Let boil a few minutes longer to reduce (concentrate) the sauce. If you cook off some of the extra liquid, it won’t make the pizza crust. 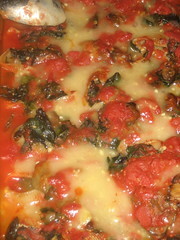 Another option is to use 1 can petite diced tomatoes, drained, in addition to the 1 can crushed tomatoes – then there is less liquid in the sauce. Vegetable Sauce (or, not-quite-rattatouille): peel and dice 1 small eggplant, slice a handful of mushrooms, and dice a summer squash and a zucchini. Add the vegetables after the onion and garlic have started to soften. 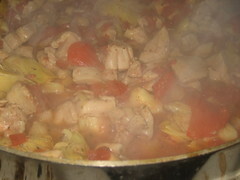 Continue cooking over medium heat, stirring occasionally, until the vegetables have started to soften. Return to the above directions, starting with adding the wine. Meat Sauce: After the onions start to soften, add 1.5 lbs ground meat. Cook until meat is browned, then follow other steps. Sauce with Sausages: Before you begin cooking, cut 1.5 lbs uncooked Italian sausages into circles. 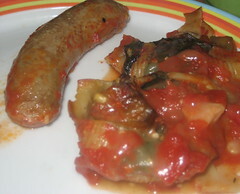 (Choose sweet or hot sausage as desired) Add sausages after onions begin to soften. Stir and cook until browned, then follow the other steps.